We decided that the entirety of our music video should be filmed in our school's Seward Studio. The set will be dressed with a white cyclorama and white floor, allowing us to flood the performance area with our coloured light with an infinity effect. 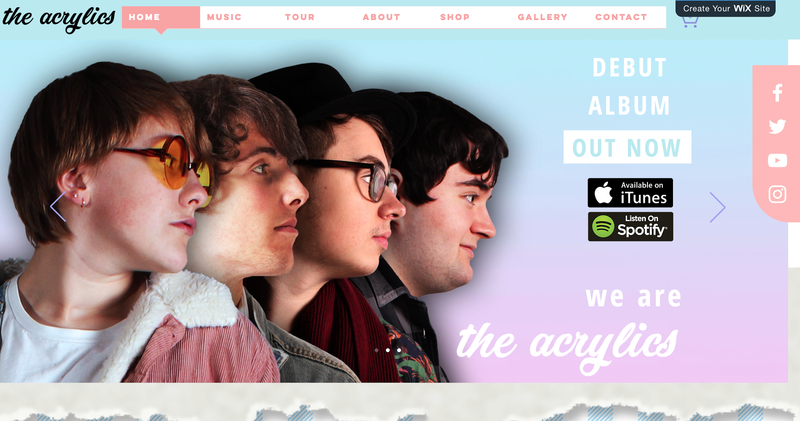 This will be our backdrop for the action of our video, and on which all the pieces of set will stand. The studio gives us a large performance area and professional standard lighting and sound equipment. This enables us to create a wide variety of lighting states that can be adjusted in intensity and colour, and then recorded as a memory, giving us creative freedom over how we can dress our set ups. We also have access to the sound system which means we can boom our track out whilst recording, both helping our singer to feel more comfortable in singing along and give a more confident performance, and making sure all our performers on instruments can hear the track to keep time. 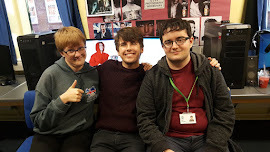 we won't need to seek permission to film on location; where we will have to seek permission to book the studio in and out of school hours, the process was made simpler by our connection to the school. the studio location helps push our band's aesthetic; we agreed that the live performance feel to singing in a studio helped push our band's image as being 'all about the music' and their performance. the tech in the studio is professional standard, which we are lucky to have access to and helps create some fantastic lighting set ups for the different parts of our narrative. We decided that all our pieces of set should be homemade. 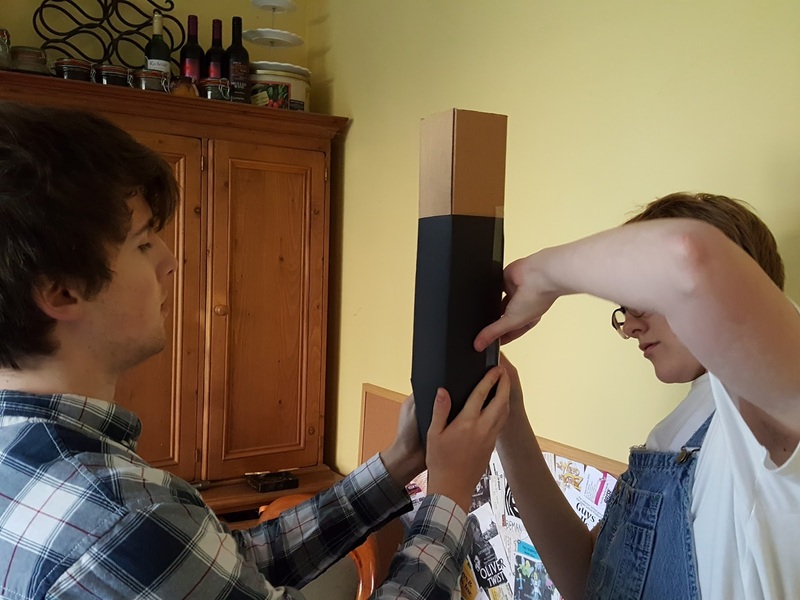 Inspired by music video's like Sia's 'You've Changed' (above), we decided to use cardboard props and set pieces as we thought the creative streak of having homemade practical effects would successfully demonstrate our band's fun loving and independent image. We achieved this by collecting as much junk modelling material as we could find (e.g. cardboard boxes, toilet rolls, old newspaper) and scheduling times where we would get together to craft or paint these into pieces of set and props in advance of our shoot. 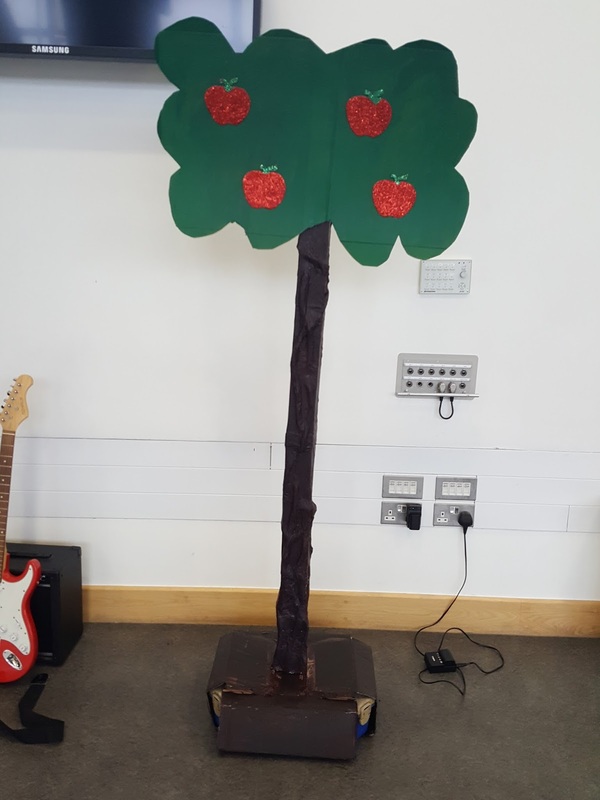 One example of how we made one of our set pieces is the apple tree; we created this by taping long cardboard cuboids together, then using PVA glue and old newspaper to papier-mâché the grooves of a tree trunk. We then painted the trunk brown, cut out the outline of a bushy tree top (painted green) and apples (covered in red and green glitter) from cardboard. Finally we stuck the top of the tree onto the trunk to create the final result. This approach to set design benefitted, not only our low-fi band aesthetic, but also helped lower our expenditure as we had to purchase very little to have all our props and set.